“Ah oui! Maintenant!” Peter announces, his eyes trained on the red flag in the distance. I begin quickly winding the crank on the small, heavy box in my hands, squinting through the sun at the same red flag. I’m on my knees in the scrubby, dusty ground in rural Siem Reap province, in the baking heat. There’s sweat on both of my cheeks and the bridge of my nose as I wind the box. Seconds later, the land and sky a few hundred meters ahead of us erupts in a vertical cloud of dust and debris, high into the air, and a moment later the deep, thunderous boom reaches me, and I don’t know if I feel or imagine the ground reverberating through me. I can’t help it, I exclaim “Oh WOW!” the realization hitting me that that’s what it feels like to detonate 172kg of explosives. The Cambodian Mine Action Centre Demining Unit 6 invited me to the detonation site after I spent the full day before scouring the area, trying to figure out who was responsible for the report that up to 80 pieces of UXO were found in a paddy field somewhere around town. Demining Unit 4 directed me to Demining Unit 6, where I met Peter Willers, the German head of the unit. As I sat in his office in the large, spacious house that serves as an office for CMAC DU6, surrounded by maps indicating contaminated and cleared areas of Cambodia, he explained what happened. The day before a soldier had stumbled across two small grenades of some sort, about 300m from a site used to launch hot air balloons, less than a kilometer from Angkor Wat, which just happens to be one of the biggest tourist sites in Southeast Asia. After Willers sent one of his deminers to investigate, it turns out it wasn’t two, it was more than 80, and it wasn’t just grenades. In fact, it was a curious case, he told me – seldom do demining units stumble across a cache of UXO so large: this particular collection included 76 B40s, four B41s, seven anti-tank mines, and about 69 bullet casings, all of which had been sitting under soft earth for since probably the Khmer Rouge period about 30 years ago. Though the local deminers were sure none of the devices were in working condition, nor, indeed, were posing a risk to anyone handling them, Willers – a retired colonel – was taking no chances. The cache would be destroyed the next day. This was my first opportunity to be part of a destruction operation, and I was determined not to miss it. Willers told me to come by the next day at 9am, which was how I found myself literally turning the crank in the middle of a field, and blowing up 172kg of explosives. To ensure all were destroyed, the unit dug a deep hole in the ground and carefully stacked all the munitions, topping them off with two anti-tank mines brought from a separate location for extra firepower, as well as a few kilograms of TNT. Usually, Peter explained, the munitions would detonate from within, so in order to ensure none remained intact after the explosion the extra charges were necessary. Indeed, when we returned to the site after the explosion, a huge crater was all that remained, although local children were starting to cautiously approach to scavenge the small pieces of shrapnel remaining – 1kg of scrap could be traded for r2000, or about fifty cents. 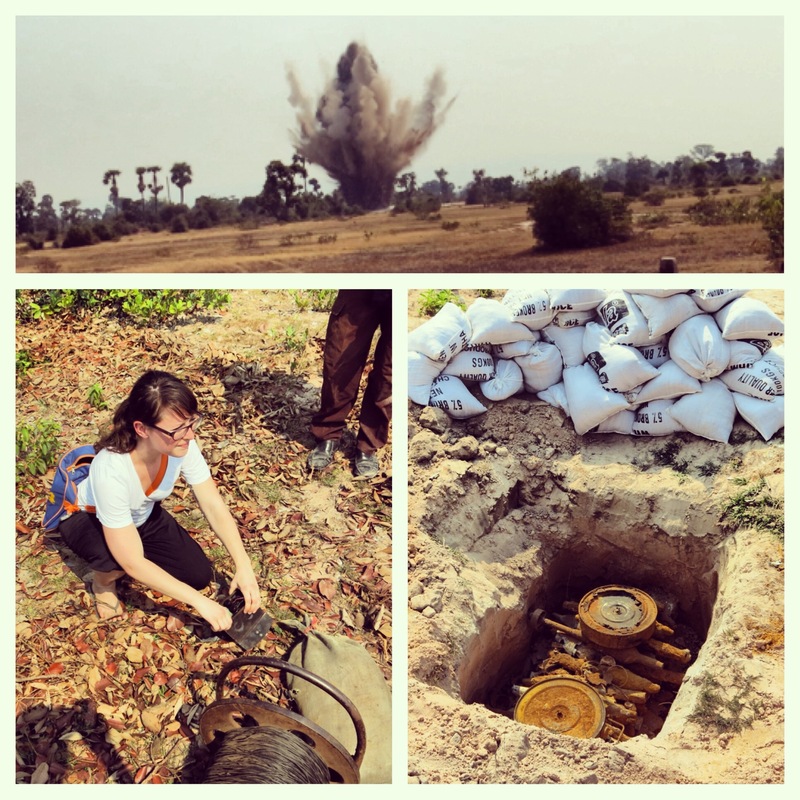 Working with the Cambodia Campaign to Ban Landmines and Cluster Bombs gives me the unique opportunity to understand the multifaceted aspects of the ICBL. Not only am I able to better understand the logistical activities of demining and clearance, thanks to our relationships with organizations like CMAC and the Halo Trust, I am also able to participate in the policy side of the Mine Ban Treaty in advocacy and awareness, as well as join in survivor assistance. Only two days before the UXO discovery/detonation, I accompanied ICBL ambassador Reth to a small village about a half hour’s drive from Siem Reap. Only 13 families lived in the village, but each one had at least one family member who was a landmine survivor, was in a wheelchair due to a disease like polio or cerebral palsy, or was living with AIDS. We visited because some of their wells need to be examined and possibly fixed, and two families had requested assistance in building a new house, because their existing one was on the verge of collapse. The visit was a stark reminder of the reality facing survivors – for whom an accident with a landmine or UXO is only the beginning of a different kind of life. On the day of the UXO detonation, we returned to the crater after the explosion to look down at the soft sand and the scraps of sandbags and the children digging for metal remnants. “These can never be used now,” Peter said – and I think that’s what this campaign is about. Those 80 devices were destroyed not necessarily because they posed a current risk – rusted out and possibly water-damaged – but because as long as they existed they posed a future risk, and that risk is one that we cannot afford to take. By detonating those 172kg, that means those are 76 B40s, four B41s, seven anti-tank mines, and 69 bullet casings that no longer pose a threat to anyone – humanitarian or deminer or otherwise.